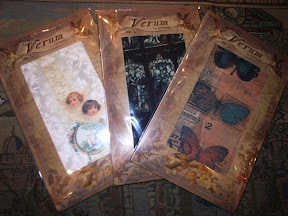 Strange Girl: "Verum" Tights Packaging Released! First pictures of the Verum packaging today on the Grimoire blog! Still no release date, but I believe it says the tights ate now available for reserve in store. Click Here for more pictures on the Grimoire blog. Click Here for pictures from the Grimoire Almadel blog. oh my, i really love the whole range *o* ! Hello! I'm hoping to snag a pair if the Vitrail and Cafe d'Emma prints when they get released. Fingers crossed!